1. There are eight structures in Montgomery on the National Register of Historic Places. What are they and which was placed on the Register first? 2. Federal survivor benefits were paid to about 24 Montgomerians after the Civil War. What was the average monthly payment per individual? This summer has flown by and I'm again overwhelmed by the generosity of our members. As you will read elsewhere in this newsletter your Society continues to accomplish wonderful things, from maintaining our shared landmark, Pratt Hall, to documenting our shared heritage. I am truly humbled by your enthusiasm, and commitment to our work. I know I've said this before but I think it bears repeating, we are temporary stewards. None of our success would be possible without the work of those who came before us, and so it is with sorrow that I must acknowledge the deaths of two MHS stalwarts. Founding member Betty Stanton passed away in early August and we hosted a memorial for her in September 22nd. Betty was an MHS founder, president (4 years), director (17 years), benefactor and more. She donated frequently to our archives and was full of ideas and encouragement. She loved Montgomery and told the best stories of her childhood summers with relatives and friends, and of her adult life running a publishing business with her husband here in town. In later life she tried to get here at least once every year and in August of 2009 presented a wonderfull slide show on her family's life here. I looked forward to her visits and always learned from our meetings. She was a remarkable lady, 90 years young, a great spirit among us. She ran for school board in Massachusettes at 83, and received a Lifetime Achievement Award from the Vermont Historical Society in 2010. An excerpt from her obituary which ran in the Boston Globe on August 9th is included below. Agatha Blodgett left us in early September. Agatha was also a founder and active in preserving Pratt Hall. She served as MHS Secretary for over 10 years and was instrumental in many of our programs during that period, including the re-establishment of the Town's annual Memorial Day commemoration. Agatha was born in Montgomery 1922 and her father delivered her "in the house that is now the post office in Montgomery" (Village). A lifetime resident of the area, she knew first hand the history of our town. and along with husband Warren, provided a wonderful oral history of their life here... "In the summer we’d go on picnics and we’d swim all day long. Sometimes you’d be like a prune by the end of the day. 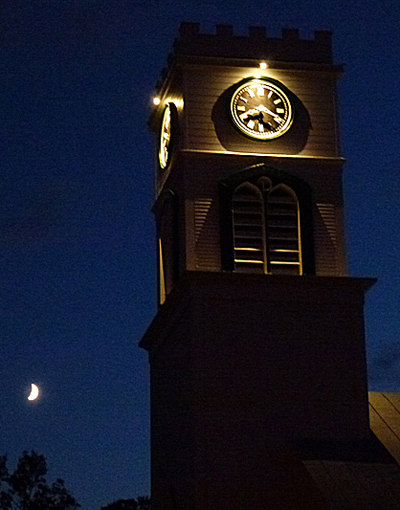 When the Historical Society (St. Bartholomew's) clock struck twelve we all came out and ran home for lunch. And then you couldn’t go back in the water until one o'clock. So when the clock struck one we’d all race out back to the the swimming hole... We were never so clean." We've included an excerpt from her obituary as well. Our thanks to these two wonderful women, and our sincere wishes their families and friends may find comfort in the memories of their lives and in the great affection we all share for them. Their spirit will live on in the work that we do. Take care of one another and thanks for your support. Membership guru, Marijke Dollois, reports we've hit our goal once again with over 200 memberships totaling over $10,000 in donations. This is an astounding accomplishment putting us way ahead of most other Societies in the State. Bragging rights aside, this allows us to keep Pratt Hall in good shape, compete for matching fund grants, and meet our other mission goals. Our thanks to all of you who have joined or renewed. There is always room for more so tell your friends and invite them to join. The Fanning / Davydov Duo will play in the heart of foliage season, October 6th at Pratt Hall at 8:00 p.m. We must reiterate our thanks to the Eastman Charitable Foundation and all our sponsors who underwrote the series once again, and to Steve Hays for his yeoman's effort pulling everything together. Art Show Reception, Show, & Sale Canceled; Trinkets and Treasures a Great Success; Open House Sees Heavy Traffic. We canceled the August 25th Art Show after we failed to receive much artist interest. The Board felt this event had probably run its course for now, and noted there were other area venues (like Artist in Residence in Enosburg) that made the logistics of exhibiting with us more difficult. We will probably put this event on hiatus, but are open to ideas from you. Our thanks to Noela McGroarty for all of her hard work organizing, and promoting our area artists and this event for the last several years. Our first "Trinkets and Treasures" lawn sale was the same day and was a great success thanks to the leadership of Parma Jewett and Sue Wilson, and the donations of treasures from all of you. We cleared nearly $1,000. Treasures included furniture, wood stoves, and a deer head! 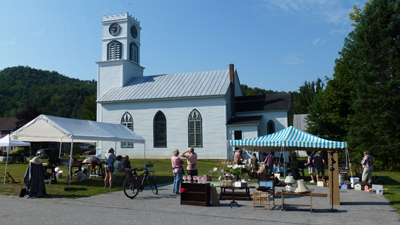 The Covered Bridges Garden Club's "Harvestfest" was the same day and we provided space for some of their vendors next to our sale. We also opened Pratt Hall where we had two exhibits; "Memories of Zack" and "Montgomery in the Civil War". We provided tours of the Hall too. We were busy the whole day and hosted many people there that had never been inside before. All were impressed with our work and appreciated a chance to get out of the sun/heat. Montgomery's public infrastructure received over $76,000 in damages from Irene in August of 2011, including damages to the water system pump station and the Fuller covered bridge. 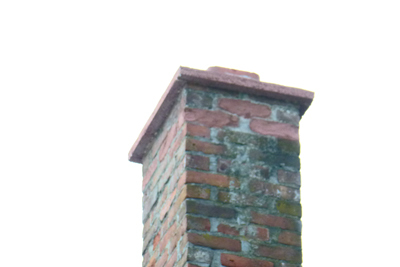 All repairs have been finished. FEMA paid for 90% of the work with the State and Town each picking up 5% of the remaining cost. Normally FEMA covers 75%, the State covers 15%, and the Town covers 10% of the costs. The Society took part in the Statewide bell ringing to commemorate the storm, ringing the bell at Pratt Hall for 30 seconds at 7:00p.m. on August 28th. 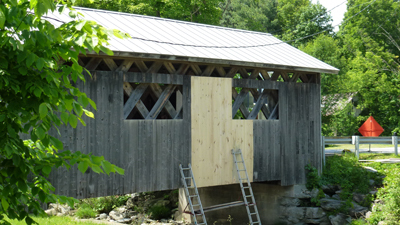 In August the Vermont U.S. Congressional delegation announced an $850,000 grant from the federal National Historic Covered Bridge Preservation program for the Longley Covered Bridge. The Town had already been working with the State for initial planning. No details on when work might begin. 2. Survivor benefits were paid to about 24 Montgomerians after the Civil War. Total Monthly Montgomery Pensions = $159 and ranged from a low $1.00/month/person to a high of $16.00/month/person. The average was $7/month/person. Click here for the latest info on MHS Events and a handy list suitable for printing. "Elizabeth M. "Betty" Stanton, 90, of Hamilton died peacefully at home surrounded by family on August 5 after a brief illness. Born in Worcester and raised in Newton she was the daughter of the late Dr. Noel and Olga Monroe of Newton and Barnstable. Betty saw life as an adventure and embraced it with enthusiasm, grace, and an indomitable spirit. As a child she learned a love of the outdoors by hiking, camping, fishing, and riding horses. Later in life, as a single mother, Betty raised her four children Cynthia, Jonathan, Rick, and Allison Mitchell in Barnstable while earning her teaching certificate at Bridgewater State and teaching at the Riverview School in Sandwich. She was an avid gardener, enjoyed sailing, and was active at the Barnstable Yacht Club. Remarried to the late Henry (Harry) B. Stanton of Cambridge, Betty added to her family Brooksie Stanton now of Barnet, VT and Elizabeth Stanton of Bellingham, WA. They moved to Ipswich, where she was active in the League of Women Voters. Later in life she and her husband moved to Montgomery, VT where she summered as a child and had deep family roots to start Bradford Books. While helping found the Montgomery Historical Society she worked as a Bradford Books editor and helped grow the company into a nationally recognized publisher on cognitive science. When Bradford Books was acquired by M.I.T. Press she returned to Ipswich, became a Trustee of the Ipswich Library and was instrumental in raising funds for its renovation. She retired from M.I.T Press at age 75, moved to Hamilton to be closer to her son Rick and his wife Carin Kale, and enjoyed spending time with Cynthia and her partner Arthur Wood and Allison and her husband Jeff Miller. Always active outdoors well into her 80's she enjoyed white water rafting, hiking in Colorado, and raising funds for renovation of the Schooner "Adventure" in Gloucester. Interested in local government and education she was elected as Trustee of the Hamilton-Wenham library and at 83 ran for school committee and participated in local government issues. She led an active, challenging life and met it with good cheer and optimism that serves as guiding light to those who were fortunate to know her." 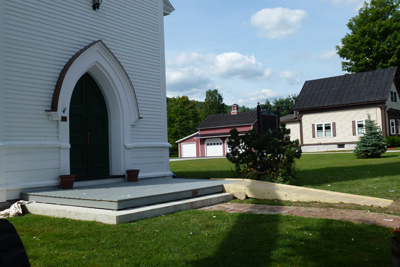 October - 1860 Joel Clapp returns to Montgomery and resumes his post as pastor at Union Church. November - 1990 Veterans' Memorial Dedicated at Village Green. December - 1982 Logging truck almost squeezes through Fuller Bridge taking decorations with it and collapsing the roof. Pratt Hall... You Look Marvelous!! Since the last newsletter we've been very busy working on Pratt Hall. Our great appreciation to member Ted Bruckner (Northeast Walls) for his skillful preparation and painting of the tower and front facade. Ted generously donated labor and materials, and brokered donations from his suppliers. 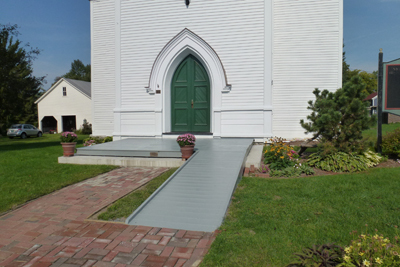 We hired member Tim Murphy and crew (Dewey Smith, Tokyo Blocher, and Nate Osowiecki) to build a new wheel chair ramp. We are likewise indebted to Tim for donating some services/materials. We also ordered new curved trim moldings for the clock faces from Tim which will be installed at a future date. The MHS Men with Tools convened to extend the brick walkway to the new ramp, reusing the bricks from the old ramp, and also stained everything grey to match. Member Steve Hathaway will be modifying the old wrought iron railing later this year which we will install on the right hand side of the ramp. While the 65 foot lift was here we used it to inspect the tower and make some repairs. 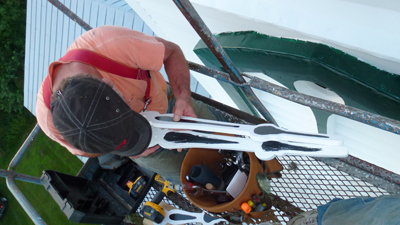 Board member Pat Farmer fabricated new hands for three of the clock faces (the front face had new hands in 2005) and installed them while your editor operated the lift. 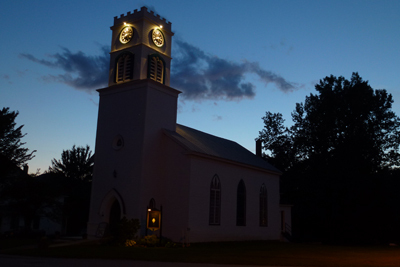 Member Andre Gareau assisted us with replacing the tower light fixtures and installing new LED bulbs. There is still work needed, especially on the wooden green trim around the bell stage louvers, but it will have to wait until next time. Marijke Dollois worked her green thumb magic re-establishing the gardens and grounds and added new porch planters for a splash of color. A big thank you to all of those involved in this work, our neighbors who had to put up with more noise than usual, and all of our members who continue to enable us to do good things for our community. We are working with the school and library to make our latest exhibit available for display and/or to make a presentation. We may also put it up at the Town Hall for Town Meeting in March if the Selectboard thinks it's a good idea. MHS hosted Upper Missisquoi & Trout River Wild & Scenic Study Group at Pratt Hall on September 20th. A Wild and Scenic River Study is a congressionally authorized study to determine whether a particular river is eligible and suitable for designation as a National Wild and Scenic River. The Study is based on the Wild and Scenic Rivers Act passed by Congress in 1968 to provide a mechanism to protect the last and best rivers of the nation. These rivers are the first in Vermont to be considered. This group has two representatives from each member Town and meets at various venues in participating communities. "Agatha Keelan Blodgett died Sunday, Sept. 9, 2012, at age 89. She was born Nov. 8, 1922, in Montgomery, to Dr. Daniel J. Keelan, who was born in Carrick McCross, Ireland, and Angeline Paronto Keelan of Enosburg. Agatha graduated from the University of Vermont in 1943 with a degree in nutrition. She and Warren married in 1946 and began a life together as a military family, traveling often and making friends throughout the country. She was a brave military wife, holding down the fort as Warren was a decorated fighter pilot in the Air Force. Agatha's passions were people, especially family, good food and cooking. She will be remembered for her kindness, devotion to family and her contributions as a volunteer in many organizations. She is survived by her husband of 66 years, Warren S. Blodgett; their four children, Stephen D. Blodgett, a geologist and musician of Ponderosa, N.M., Daniel D. Blodgett, a geologist and physician of Coarsegold, Calif., Amy A. Blodgett, a nutritionist and nurse of Burlington and Rebecca Blodgett Brush, a nurse practitioner of Fairfax; and three grandchildren, Eva Osmer-Blodgett Levi of Fort Collins, Colo., Ethan R. Brush of Arlington, Mass. and Adam W. Brush of Fairfax. She was predeceased by three siblings, Gwendolyn K. Feix, Gretchen K. Diana and Charles I. Keelan. Burial will be in Hill West Cemetery in Montgomery at a future date. "